When you think "muscle car" many picture a prehistoric V8 belching exhaust and cheesy rock music. The 2015 Ford Mustang is not that car. They've chopped the number of cylinders in half and added a host of new tech so they can promise more power, performance, and, yes, even efficiency. It doesn't just look like the future. It is the future. Even if it's a car you'd never own, it's hard to hate a Mustang. Any Mustang. It was a first car, a dream car, a graduation present, a project car or the car you thought to yourself, "God, that's good looking." Few other cars in history do all of that. But Ford has been guilty of riding on that Mustang sentiment for far too long and hasn't turned out a truly revolutionary car since that first car 50 years ago. Yes, it finally has independent rear suspension, which means it's caught up with the rest of the world and abandoned a suspension setup you'd expect from a car that stars on The Andy Griffith Show. When you want to drive it every day, it should be like a modern car. For many buyers, that's a very good thing. Ford wants the Mustang to branch out and be a global car, with as much as 10% of the total output going overseas. That's why it's being prepped with options, from an fuel-sipping four-cylinder engine to adaptive this and that. There's going to be a 2015 Ford Mustang for just about every taste, thanks to the tech. We'll have a full design analysis, but there are some instant impressions. For all the throwback cues (like the LEDs in the headlight that mimic the original model's gills), this is a nice-looking car. Even in performance GT form, it isn't aggressive like a Camaro, nor imposing like a Challenger. The Mustang didn't become a "muscle car" for a few years. It was a "pony car" and this Mustang carries on that tradition. From the rear, there's a touching tribute to original fastback Mustangs. It looks like it should be a liftback, actually. The 2015 Ford Mustang Is A Fastback Alright! Look at the car long enough, though, and it grows on you. Oh, and the sequential turn signals remain. My lust for the current Mustang, even in V6 convertible weekend special form, was based primarily around those. People who fear anything mechanical that can't be fixed with a rock will be glad there are still plain and simple V6 and V8 choices in the engine lineup. The 3.7 V6 has "at least 305 horsepower" and the 5.0-liter V8 has "more than 420" now, which is an obscene amount. But the V6 is for rental fleets and the V8 is for traditional power-hungry gearheads who'd buy the Mustang anyway. 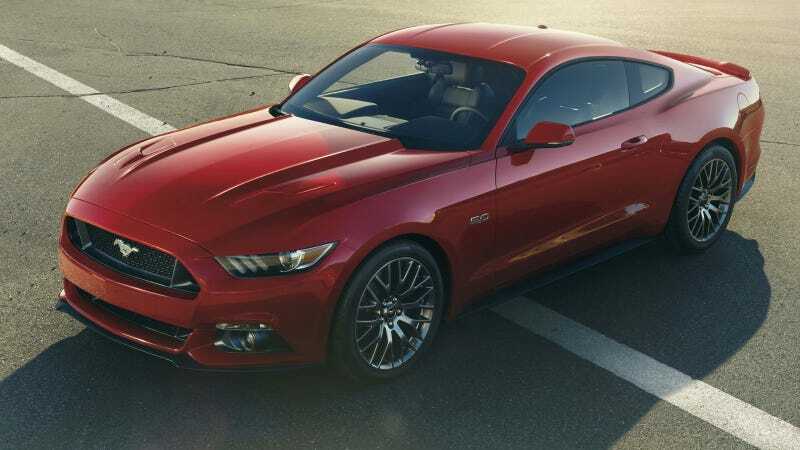 If you're not someone who was interested in buying a Mustang before, your interest lies with the 2.3-liter EcoBoost four-cylinder with "at least 305" horses. While this isn't the first time Ford has tried to turbocharge a Mustang (that honor goes to the '79 Mustang and the quirky Ford Mustang SVO after that), the idea of putting an engine with half the normal amount of cylinders in a car like this may sound like sacrilege to some but it makes perfect sense. Don't think of the 2.3-liter four as the little brother to the V6, think of it as Facebook to the V6's MySpace. The EcoBoost option is going to be more expensive than the V6 because it promises to be faster, more efficient and more powerful. How a smaller engine makes more power has everything to do with the EcoBoost mission: Turbocharge all the things! An engine is just a device that produces a lot of little controlled explosions. Those explosions are the result of a spark meeting fuel + air. In the past, car companies just made bigger engines with bigger cylinders to let more air and more fuel in. This isn't always efficient, but it worked. What a modern four-cylinder turbo engine does is force denser and colder air into that cylinder at a higher compression, yielding an explosion that's just as big but uses less fuel. That's a bit of a simplification, but you get the idea. The new 2.3-liter EcoBoost also benefits from a twin-scroll turbocharger to deliver more power sooner in the rev band, where it's most usable for driving. The other advantage of the engine is it's likely lighter than its V6 and V8 siblings. Weight is the enemy of speed, and a lighter engine up front could easily yield a more balanced sports car. A new Performance Pack for the Mustang GT will be offered with the EcoBoost and the 5.0-liter, as we detailed earlier, which will add big wheels and brakes to all of the shoving power. But now with selectable driving modes and "Track Apps" that sounds Porsche-like, the GT wants to be taken seriously on a track. That seems to show Ford made a concerted effort into making the Mustang talented at roads that aren't straight, too, taking what they learned from the Boss 302 Mustang and applying it to this car. Fortunately, the transmissions stay simple. There's a proper manual as before, but at least the automatic option gets paddle shifters with rev-matching downshifts. Is this going to be a driver's car as well as a look-good-feel-good device? Only one way to find out, but it sounds fast on paper. My first Mustang memories are not from a classic '64, but from a convertible of the late '80s. Red on red with a red, hard dashboard and the button-riddled corporate Ford radio, there was no point in time when it actually looked good. What a difference 25 years makes. There's a great dual cowl thing going on with the dash, but it's not a circle-fest like the '94 Mustang. There's lots of real-looking stitching everywhere, a big slab of silver across the front and buttons that look really substantial. It's nice looking switchgear, and who cares if the wiper stalk came from a Fusion? Yes, yes, MyFord Touch has consumed a lot of real estate up front. It's more button-heavy, too, sort of resembling what's offered in certain trims of the F-150, like the Raptor. In my experience with it, the physical controls are welcomed, as MyFord Touch has a bad reputation for being too finicky to use while driving. Ford's constantly improving all things MyFord Touch, so it might be usable now. And new features like standard keyless access and start, and optional blind-spot monitoring and cross-traffic alert bring the Mustang into a very techy part of the class. Much like all recently redone Fords, the 2015 Ford Mustang has been given a big helping of equipment, class and EcoBoost. Sure, you can make it a V6 style machine if that's your thing. But like the 2014 Corvette Stingray, it wants to be a sports car that's good... without the qualifiers. On the surface at least, Ford has nailed the modern/retro combination. There's just enough throwback to old Mustangs to show it hasn't forgotten where it came from, and yet it looks new enough. It isn't menacing, but it looks grown up in a good way. It looks like it wants to be taken seriously. The Mustang has a lot of people to please and it appears Ford has learned the lesson of 1964 without building a car whose reference to that moment in time is anything more than aesthetic.